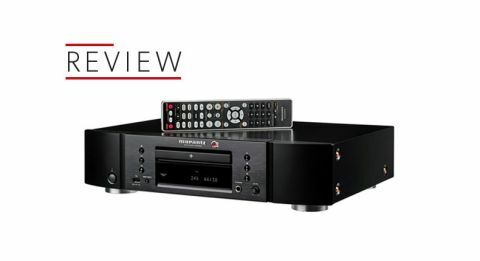 Marantz CD6006 UK Edition review | What Hi-Fi? When it comes to CD players, few manufacturers come close to matching Marantz’s track record. The CD6006 UK Edition gives no sign of that vice-like grip easing. The UK Edition is a specially tweaked version of the CD6006 for this country, and it replaces the original in the UK (though the standard CD6006 continues in the rest of Europe). Marantz has a similar upgrade for the partnering PM6006 amplifier in the pipeline. Those familiar with the standard (and, let’s not forget, Award-winning) CD6006 may well look at this player and wonder if anything has changed. Take the UK Edition badge off the new one and they look identical. That’s no bad thing - we’ve long praised the player’s solid build and smart finish. The controls work with precision and the transport is commendably quiet. There are machines that cost hundreds more that don’t feel this good to use. The features set is much as we’d expect from a player at this level. There are optical and coax digital outputs alongside the standard RCA analogue feed. Look around the front and you’ll find a clear display and simple button layout. There’s also a USB input, which allows the connection of Apple products and USB memory devices. It’s compatible with MP3, WMA, WAV and AAC files. Marantz isn’t particularly forthcoming regarding the internal differences between the standard and UK Edition, but we know they centre on improvements to the power supply of the digital-to-analogue circuitry and upgrades to the analogue output stage. The company has built part of its great reputation on the ability to tweak its products by improving component quality and this player, with specially selected ELNA capacitors used in sound critical places, is no different . The target was to improve dynamics and sound-staging in particular. While none of this appears ground-breaking, some of the team behind the product have been involved with CD since the beginning. They have a breadth of knowledge and experience of the subject that’s hard for the competition to match, let alone better. Once we start listening, it doesn’t take long to discover they’ve done a terrific job. The new player delivers a crisper, clearer and more robust sound than the highly rated original. As with the standard version, it’s worth turning off the digital output and display for serious listening. The player just sounds cleaner and more precise this way. We load Bruce Springsteen’s Magic into the UK Edition’s slick drawer and sit back to enjoy a full-blooded rendition of Radio Nowhere. The Marantz punches harder than ever with this track, delivering the song’s momentum with considerable skill. The wailing guitars come through with power, while the Boss’s vocals are rendered with all his renowned energy and passion intact. There’s plenty of detail, and the ability to organise it into a musical and cohesive whole. Before we know it, we’ve got to the final track. The production is demo-like in its rawness and can easily sound coarse and edgy. The CD6006 UK Edition proves none of the base version’s much admired refinement has been lost, but there are notable gains in the ability to dig deeply into the fabric of the recording. The standard player sounds a little blurry and dynamically restrained by comparison. The Planets by Holst is a tough test, but one that doesn’t faze this player. It takes the wild dynamics of Mars in its stride, delivering a full dose of power, scale and drive in the process. The stereo imaging is stable and precise, while the player’s tonality doesn’t stray far from the slightly rounded balance Marantz’s products have long had. This new one has a touch more brilliance at the top end, which is enough to add more bite - but not so much that poor or aggressive recordings become wearing. We run through a whole range of music from the pure, heartfelt soul of Nina Simone right though to Bon Iver’s dizzying 22, A Million set, and the CD6006 UK Edition doesn’t come up short. It’s more exciting and informative than the standard version, but never strays too far from the template that has made Marantz’s affordable players so good. Despite all the insight this remains a forgiving listen, one that won’t make a meal of a poor recording. This unfussy nature makes it easy to partner too. We try the built-in headphone output and it retains the same admirable sonic traits as the line level feed. Marantz has given a good deal of thought to this output, offering not only a dedicated volume control but different gain settings (available through the set-up menu) to improve headphone matching. What would you match this CD player with? The obvious amplification partner is the PM6006 amplifier, of course, but we also get excellent results with Rega’s Brio (£600) and Elex-R (£900). There’s plenty of sonic stretch in this design, and it doesn’t sound out place even when used in far pricier systems. To sum up, we think this is a great player for the money. In our experience you need to move up to the likes of Cyrus’s CDi or Naim’s CD5si to get a proper jump in sonic performance. A bargain? Without a doubt.